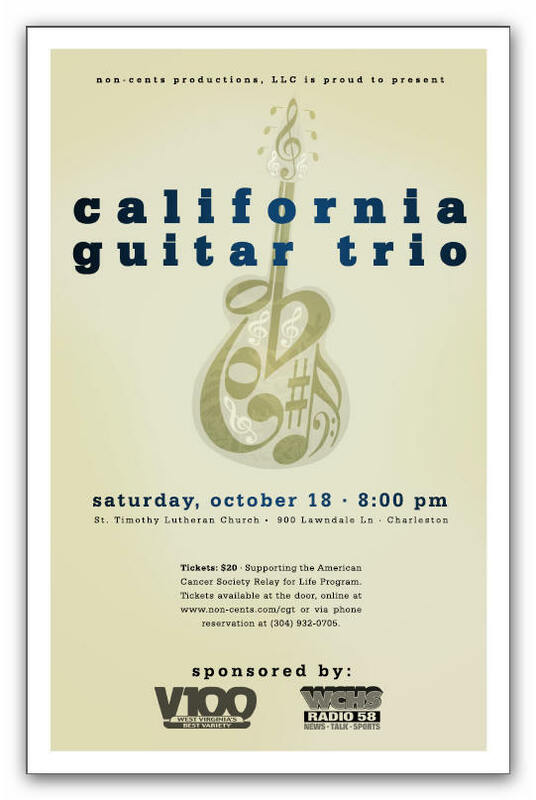 The guys put on another amazing show on October 18th at St. Timothy Lutheran Church. We are so thankful to Rev. Mahan and the church staff for the use of their beautiful facility. Although we are still struggling to get at the audience level would would like to see, we are coming along and the use of St. Timothy helped greatly. Also, special thanks to RIc Cochran and Jeanne K. of V100 for their support and for their role in community awareness. Your help and friendship are very much appreciated. This concert was very special in that the band invited Dilek Engin to join them on viola for The Marsh and Portland rain. Dilek was simply amazing and a perfect compliment to the trio. And for this concert, I saw Tyler Trotter use superhuman skill to get the sound to his liking and to reset things the way they were after the show. Nick Gatens has been kind enough to design a custom poster for the upcoming concert. Our thanks to Nick for his cool design! © 2008 non-cents productions, LLC.